It's so crappy it's awesome. Another pic and some info after gap. 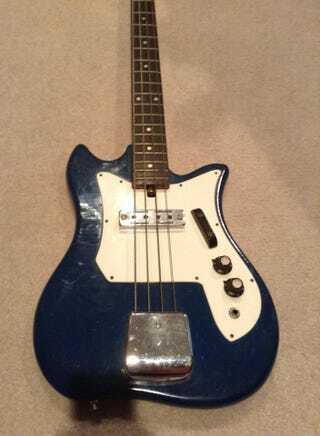 It's a Kay KB-10 short scale (about 30" from nut to bridge) bass built some time in the 70s, I can't find any real info on it. The paint is in terrible shape, so I may repaint it; perhaps with the Imperial Japanese flag stripes, or a black and white version of said flag. It's also my first bass with frets (the old fender had its pulled decades before I owned it).